U.S. President Barack Obama heard the Catholic Church's concerns over his health care plan while on a visit to the Vatican on Thursday, but drew a cheerful response from Pope Francis when inviting him to visit Washington. Catholics and members of other religions say the mandate, which is the subject of more than 100 law suits across the United States, is a violation of their beliefs because it forces them to support contraception and sterilization. "It is a great honor. 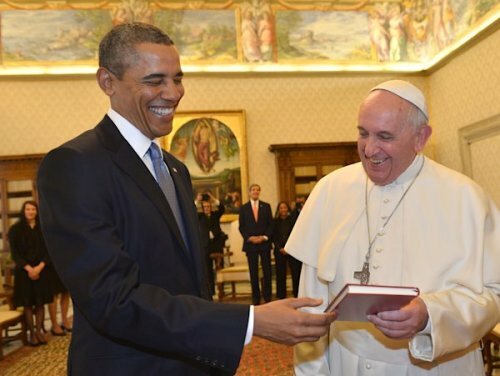 I'm a great admirer," the president said as the pope greeted him and they sat at the pontiff's desk. "Thank you so much for receiving me."